Ms Xu, a young-looking 55 year old, was wearing a smart red coat with matching mittens. She greeted me with a cheery hello, as if she knew me. After checking behind me to make sure she wasn’t talking to someone else, I responded equally warmly. “Are you cold?” she asked. “Only my legs,” I replied. After a spot of mental arithmetic, I worked out that Ms Xu’s family had been here for at least a hundred years. The scale of the “Catch 22” impasse became clear when she told me that the authorities have told the community that they can’t tell them where they will go until they have signed something to the effect that they are happy to go. “How will it be sorted,” I asked. I asked her how many people would be affected by the move. “There are more than a thousand people still living here,” she said. “Are you a reporter,” she asked. “Why are you talking to me then,” she joked, revealing a bright white smile. 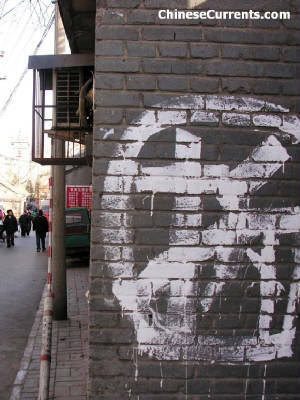 I thanked Ms Xu for her time, and continued walking up the hutong, into the face of the bitingly cold northerly wind. 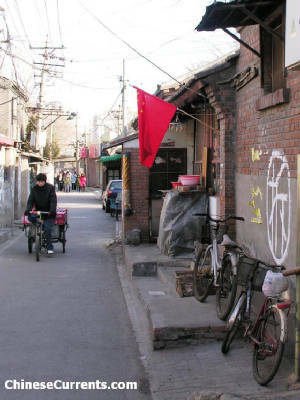 A hutong is a narrow lane, flanked by courtyards. Each courtyard would typically have more than half-a-dozen small one storey houses – each with no more than twenty square metres of living area. 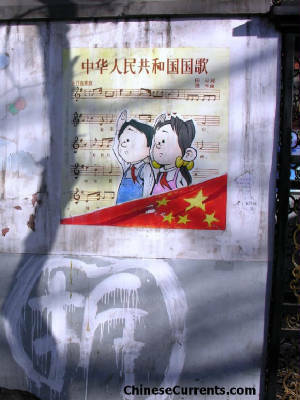 The area south of Tiananmen is one of the last remaining strongholds of hutongs. A number of them are well maintained and apparently now enjoy some kind of protection. 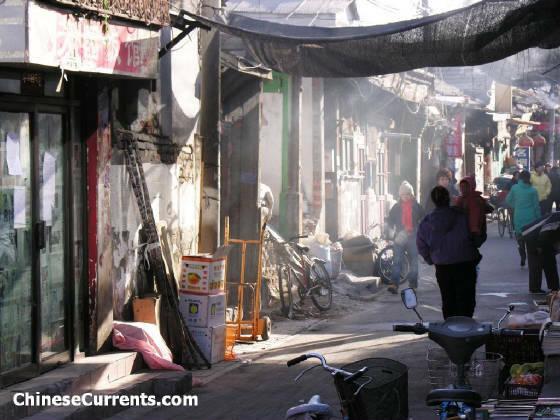 This hutong, however, which is one hour walk south of Tiananmen, is off the tourist track and is a good example of what life was like in this city for the majority of residents before the 90s boom. I spoke to a few younger residents – a young woman, about 20 years old, and two young teenage boys – and they were ambivalent about the situation. “Are you excited about moving, or are you happy to stay here?” I asked. The young lady was equally relaxed about things: “I really don’t mind if we stay, or if we go. As long as my parents are happy, then everything is fine,” she said. I was relieved when I reached the T junction, where one narrow lane intersects with another, so I could turn out of the headwind. Just along and then south from there, I saw something that reminded me just how hardy the Beijinger truly is. 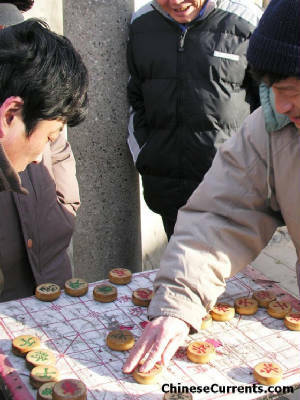 Two men, in their early fifties, were playing Chinese chess on a large board, surrounded by four spectators of various ages. “Check!” shouted the man in the long brown coat, slamming his pao, or cannon, down on the board with such force that several of the pieces jumped on the their spots. From then on, the pace quickened, the players grew more animated and the spectators cheered on their favourite player. Then, following a ma, or knight, move it was all over. They looked up for the first time, to see me. “Do you play,” said the winner. “Then play him,” said the victor, pointing to the loser, who was, I think, not best pleased at the prospect of playing a foreigner at one of China’s national games. I started slowly, finding it hard to make sense of a few of the characters on some of the more worn wooden roundels. I needn’t have worried, because one of the spectators behind me had decided to help by making either encouraging noises (if I was moving the “right” piece in the “right” direction) or grunting his disapproval when I was about to make the wrong move. The game had been in progress only a few minutes when I decided that, with a chill factor of more than minus twenty degrees blowing in my direction, it was in my best interests to conclude the game as quickly as possible. Playing chess in Beijing in winter against the wind is no fun, and I had no desire to make the news as the first person to die of exposure while playing a board game, so I tried to exchange as many pieces as quickly as possible – in the hope of a securing a quick, not to mention face-saving draw (the best strategy when one is up against a superior force). Five more excruciating minutes later and it was all over. A draw! I thanked everyone – especially my adviser behind me, without whom I would have lost badly – and tried to get my frozen legs moving again. Predictably, the subject of the "move" cropped up. The chess players' view was in line with everyone's I spoke with that day: As long as "the three conditions" were met (ie acceptable apartment size; not too far away, and a reasonable cash payment on top of that), then everything would be fine. They were really quite relaxed about it. In fact, no one I spoke with seemed flustered by the delay, or by the evidently deteriorating conditions of their neighbourhood. Unlike my “let’s get it over with quickly” chess-strategy, they are preparing for a much longer game. After all, their families have been there for over a hundred years, so why rush into things. And, judging by the standard of Chinese chess I saw that day, they have every reason to feel quietly confident. "This place will soon be gone, so make sure you take lots of photos."